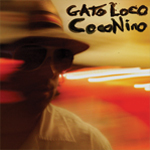 On their MySpace page, Gato Loco describes itself as Death-Danzon. Well, that's certainly a part of the group's pan-Latin mangling. Or how about "avant mambo"? Or "a giant tarantula dancing with a woman in slow motion"? Yes, of course. Stefan Zeniuk is the ringleader. A barely-controlled chaos is the sprawling combo's accustomed state and their pressing task for this album is to harness that raucous, celebratory atmosphere. At 35 minutes, it's a short blast, but eight tracks make up "CocoNino" itself, which is a rabble of a suite, dashing through a variety of complementary style-graftings. The electric guitars of Mike Gamble and Clifton Hyde provide a significant amount of grit, recalling the retro-extreme Latin projects of Marc Ribot, part '50s reverb and part frazzled rock from a few decades later. Unavoidably, the horns are dominant, given that most of the 12-strong membership blow tough, ranging from Zeniuk's tenor and bass saxophones (plus bass clarinet), through trumpet, trombone, bass trombone and right down to a gruffly straining tuba. A three-man percussion battalion drives forcefully, from full kit to ratchet and, er, frog. Zeniuk shapes a mottled glitz to disguise his leviathan's dancefloor glide as they parade across the decadent ballroom, exhuming vintage south-of-the-border stylings. The horns slur and slide, with no shortage of deep low end. The second 'movement' opens with a blubbery tuba, hinting at a New Orleans procession, but by the third part Gato Loco are acting as if Jamaican Ska is a Latin sub-division. The solos don't over-extend themselves. There's a swift procession of pointed displays. On the fifth episode, Hyde's acoustic guitar picks light web-strands amidst heavy horn interference. The sixth section boasts a notably strong tune, riffing all the way to TV themeland. Next, the drums get low and we're lost in Brazil, Trinidad or Transylvania. Hurtling on regardless, the "CocoNino" climax is sustained until the closing part's wind-down. Track Listing: CocoNino #s 1-8. Personnel: Stefan Zeniuk: tenor/bass saxophones, bass clarinet, voice; Jesse Selengut: trumpet, flügelhorn; Eric Biyondo: trumpet, voice; Kevin Moehringer: trombone; Rick Becker: trombone, bass trombone; Joe Exley: tuba; Clifton Hyde: acoustic, electric & classical guitars, voice; Mike Gamble: electric guitar; Ari Folman-Cohen: bass; Greg Stare: drums, percussion; Brett Tyson: congas; Rich Stein: percussion.